This is an American Pelican reflecting at the San Diego Wild Animal Park. I found a new meme at Newton Area Photo. If you'd like to join in visit James, here. Thanks for joining the meme Jan. Great reflection. I love the look the bird is giving you. Water is a really good place to see reflections, I'm going to start looking for them. I love white Pelicans. They are just so neat, and thanks for the invite to the new meme. I checked it out. Think I'll like it. We don't have pelicans here so I always think of them as being very exotic! Nice shot! 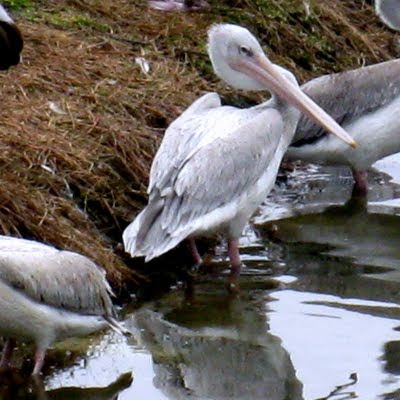 Pelicans are such interesting birds!